After invigorating sauna treatments at your favorite spa or salon, do you often wish you could have your very own sauna at home so you could enjoy sessions anytime you wish without having to schedule or pay? With the best infrared sauna blanket, you can make your wishes a reality. Since this type of sauna is foldable and portable, you will even be able to enjoy sauna therapy at any place, even when in the office or traveling. Whenever you need a session, just hop inside your sauna blanket. The safe and highly beneficial far infrared rays it emits will penetrate deep into your body, making you sweat profusely and reap the detoxification, beauty, rejuvenation, weight loss, and health benefits of infrared sauna therapy. If you are looking for the best far infrared sauna blanket, you can confidently go with any of the following five picks. Our buying guide will help you decide the perfect pick for your needs. 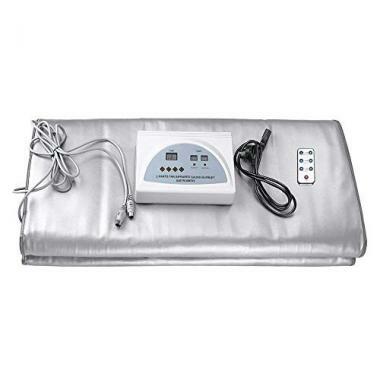 Our top pick is this top rated far infrared sauna blanket by Gizmo Supply. It is the best infrared sauna blanket for both professional and home use. Everything about it is impressive. With a temperature range of 77 to 185 degrees Fahrenheit (30-85 degrees Celsius), it can get really hot and induce a good sweat. You can also select a low temperature for comfort if you're a beginner or prefer a comfortable heat level. It is composed of three independent heating zones: upper body, abdominal section, and lower body, and you can select a different temperature for each zone. It has an up to 60 minutes timer. The quality is top-notch. This sauna blanket is made of a solid PU material on the outside. The inside is a soft and flexible waterproof PVC that can accommodate different sleeping styles. The materials don't have a chemical odor. The heating wire can withstand stretches and bends. Its dimensions make it a versatile sauna blanket that accommodates all sizes and shapes. It takes less than 5 minutes to set up for sessions and it is compact and easy to store. 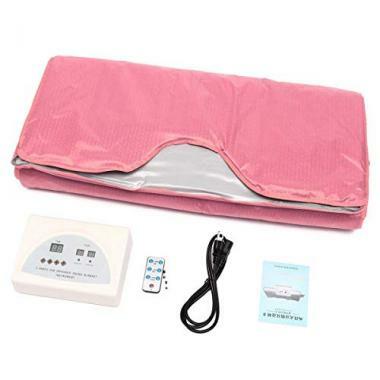 Infrared sauna blanket reviews by users show that this Gizmo supply sauna blanket helps with muscle/joint pain, inflammation, fatigue, and infrared blanket weight loss benefits. It is a solid investment whose benefits you will enjoy for a long time. The outside of this fir infrared blanket by HUKOER is a soft PU material while the inside is a waterproof PVC. It comes in pink, silver, and purple so you can choose your favorite color. Its temperature range is 86℉ to 176℉, and it has three heating zones for optimal results. If the blanket gets too hot, a safety switch automatically disconnects it and sounds an alarm. Session lengths range from 15 to 60 minutes. This infrared blanket is very easy to use and heats up very fast. Sessions in it are relaxing, rejuvenating, and detoxifying. The health benefits you can expect from it include weight loss, stress relief, relief from joint pain and stiff muscles, and healthy skin. Once it cools down, it folds up nicely and can be stored easily. This slimming infrared sauna wrap by TTLIFE is designed to deliver sauna weight loss, body shaping, beauty, and rehabilitation therapy benefits. It emits 9-14um of far-infrared radiation, which is safe and easily absorbed by the body to deliver these benefits. It has a temperature range of 35 to 75 degrees Celsius and heats up very quickly to the desired temperature. It gets really hot but is also comfortable to use. A safety switch will automatically disconnect it and sound an alarm if it overheats. It has two heating zones control and length of sessions ranges from 15 to 60 minutes. It is also well built. The outer fabric is a high-grade PU material while the interior is a flexible waterproof PVC. This colorful Far-Infrared (FIR) sauna blanket by Lofan can get as hot as 80 degrees Celsius. The safe and beneficial far infrared rays it emits travel deep into the body, heating the organs and inducing profuse sweating and deep detoxification. It has relaxation benefits, relief from joint pain and stiffness, and other infrared and sauna benefits. On the outside, this unit is made of top grade PU material. The inside is a soft and flexible waterproof PVC. It is meant to be used with plastic sheetings. Once it cools down, it folds down into a compact package for easy storage. This sauna blanket by Semme will loosen your muscles and relieve physical fatigue to make your body feel relaxed. It will boost your metabolism and slim your body. You will also reap beauty and anti-aging benefits from its use. It has a long and wide design so people of all shapes and sizes can fit in. It is great for home, salon, and spa use. Its temperature range is 35-75 degrees Celsius. It also has independent zone control so you can individually program the heat settings for the upper body, waist section and lower body to get the results you desire. In case of overheating, it has a safety feature that automatically disconnects the line and sounds an alarm. Length of sessions in this sauna blanket range from 15 minutes up to one hour. It is a quality sauna blanket built to last. The exterior is made with a high-quality PU exterior and the interior a waterproof PVC material that is flexible so you can lay in it comfortably in different sleeping positions. The heating wire is strong enough to withstand stretching and bending. The design will determine the kind of experience a sauna blanket will offer. It is therefore important to look at how each blanket is designed. The best sauna blankets have three heating zones that can be controlled independently. Check the dimensions to ensure you get a blanket that is spacious enough for you to fit in comfortably. A sauna blanket should also be foldable into a compact package so it can be stored and transported easily. The material should be soft, flexible and waterproof. Infrared energy is not only safe but also very healing and rejuvenating to our bodies. The best infrared sauna blankets utilize far infrared technology and emit 4-14um of far-infrared radiation, which is similar to the frequency of cells in the human body. These Far Infrared Rays (FIR) are easily absorbed by the human body. The heat they produce penetrates deep under skin, muscle, and bone into the tissues, cells, organs, and joints promoting deep detoxification and healing. The best infrared sauna blankets have at least 3 heating zones for the three zones of the body: the upper body, the midsection, and the lower body. The best also offer independent heating zones control allowing you to set a different temperature for each of the zones. Is your goal to shed abdominal fat? Just set a higher temperature for the midsection so you will sweat more and burn fat in that section. They also allow you to customize the blanket by choosing your preferred temperature and duration of sessions. A sauna blanket with a memory function can remember your temperature and timer preferences, so you don’t have to set them every time you use the sauna. Just hop in and enjoy the heat therapy. The material makes up the blanket so it is essential that it is strong, soft and comfortable, heat resistant and with a flexible tensile capability to accommodate different sleeping positions. With the best infrared sauna blankets, the exterior is made of top grade polyurethane (PU) material, which can withstand high temperatures while the inside is waterproof polyvinyl (PVC). The heating wire should be able to endure stretches and bends without breaking. Check the reviews of the sauna blanket you’re considering to ensure it doesn’t have a chemical smell. For the best sauna experience, the heating elements in an infrared sauna blanket should have excellent heat conductivity. Carbon fiber heating panels produce the most heat making them the best infrared heaters for personal saunas. However, they cannot be controlled separately. The best sauna blankets have infrared heating zones that utilize the same technology carbon fiber panels use but allow for separate control of the heating zones. The standard temperature range for sauna blankets is from 77-80 to 160-170 degrees Fahrenheit, so you are able to select your preferred heat level. Most of the units can reach a max temperature of 150 Degrees F.
This is not as hot as it gets in traditional saunas but sauna blankets still deliver sauna benefits, even at lower temperatures. This is because they use far infrared light to heat up our bodies directly and penetrate deep into our tissues. If you find traditional saunas too hot to bear, you will be able to enjoy the benefits of sauna therapy at a comfortable temperature inside an infrared sauna blanket. Sauna blankets are meant to be used laying down. They tend to be a snug fit, so are not a good choice if you get claustrophobic when in a tight place. Portable saunas meant to be used while seated tend to have more room and are the ideal option if you prefer to sit down during treatments or get claustrophobic easily. Q: What Are The Advantages of A Fir Real Heating Blanket Compared To A Regular Sauna? A: First of all, an FIR real heating blanket is accessibly priced and the sauna sessions are free. It is also lightweight, foldable into a compact package and can be easily transported and used anywhere. As a home sauna, it requires little space and is easy to use. It doesn’t have installation hassles. It is a convenient and economical way to enjoy the health benefits of sauna treatments wherever you are and whenever you wish. If you can’t afford frequent sessions at regular saunas, can’t afford to have a regular sauna installed in your home or don’t have space for it, a heating blanket is perfect. 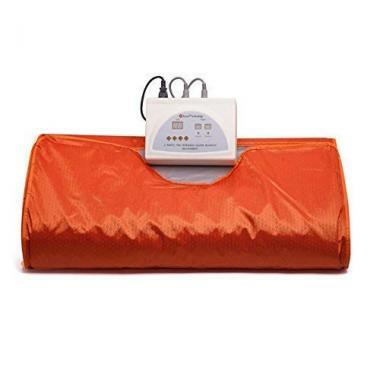 Unlike a regular sauna, an FIR heating blanket uses far infrared technology. It emits far infrared rays (FIR), which are easily by the human body and penetrate deep into the tissue. It delivers results at lower temperatures, making it a viable option for people who can’t tolerate the high heat in a regular sauna. Heating blankets also have different heating zones, which can be adjusted separately for optimal results. Q: What Are The The Health Benefits Of Using An Infrared Sauna Blanket? A: Infrared sauna blankets deliver the health benefits of an infrared sauna conveniently. All you have to do is lay inside your FIR infrared blanket. The FIR will heat you up and induce profuse sweating out of toxins leading to deep detoxification. This heat also destroys disease-causing bacteria and viruses. After every session, you will come out feeling relaxed, refreshed, and rejuvenated. Several sessions in an infrared sauna blanket will lead to loss of pounds and inches, improved immune system, improved respiration, improved blood circulation, reduced risk of cardiovascular diseases, speedy recovery after intense physical activities, reduced pain and inflammation, joints and muscles pain and tension relief, reduced stress and fatigue, increased energy levels, reduced cellulite, and glowing skin. The overall result is a stronger and healthier body. Several studies have investigated whether infrared saunas help in the treatment of chronic health problems such as high blood pressure, diabetes and rheumatoid arthritis and found that FIR do have some beneficial effects. Q: Why Choose a Sauna Blanket Over Other Type of Saunas? A: Find traditional saunas unbearably hot? Enveloped by a sauna blanket, you get to enjoy infrared sauna benefits in a warm and cozy environment. 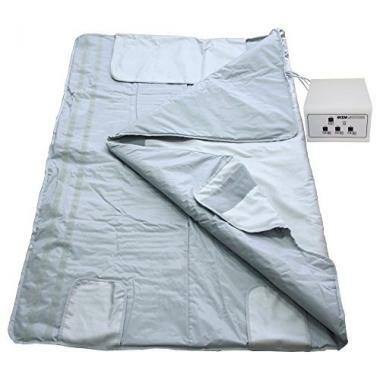 A sauna blanket is also user-friendly and highly convenient as it is compact and portable. You can enjoy sauna treatments anywhere and anytime. There are no installation hassles and you won’t have to schedule and pay for sessions. A sauna blanket also has heating zones and allows you to set different temperatures for the zones so you can experience the desired results. Saunas have been in use for thousands of years in many parts of the world. 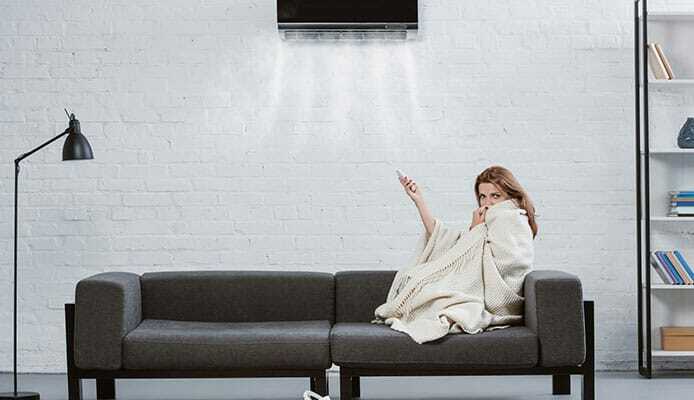 Today, you don’t have to install a large and expensive infrared sauna blanket or have to schedule and pay for sauna treatments in a spa or salon. 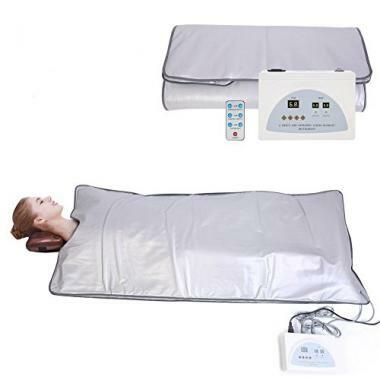 The best far infrared sauna blankets will offer you the beauty, relaxation and health benefits of sauna therapy anytime you wish and wherever you are. If you’re skeptical and wondering whether infrared blankets really work, they do. Infrared sauna blanket reviews by actual users attest to this. Infrared sauna blankets are also safe as the FIR energy they emit is safe and beneficial for our bodies. To make the most of your sauna blanket investment, we recommend 3 to 4 sessions per week. You can also relax and rejuvenate at the comfort and privacy of your home by soaking in a hot tub or having a steam shower. How about you? Which sauna blanket is your personal favorite, even if it isn’t included in our far infrared sauna blanket reviews? Let us know your thoughts and experiences in the comment box below!